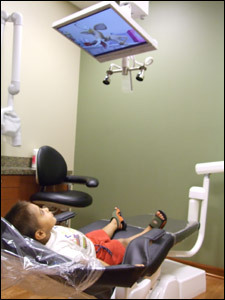 Most people are not fond of dental offices and only visit a dentist because of necessity. Dental office amenities are an easy way to attract more patients to your practice by distinguishing it from other dentists in your neighbourhood. They also improve patient comfort and satisfaction encouraging more repeat visits and higher patient retention. In that sense, dental amenities are an important aspect of good dental practice management. Given below is a list of amenities you can add to your dental office. Snacks help patients refuel after a long commute or hectic work day while they wait for they wait for their appointment. Many patients skip breakfast/lunch to make the visit, specially on weekdays and a free snack would be a very welcome addition for them. Drinks help patients replenish and relax on a hot afternoon while they wait for they wait for their appointment. Water is a must have but you can change the selection of drinks based on the season. Patient comfort is the top most priority of any dental office and the following amenities will help your dental patients relax before, during and after the treatment. Reading is one of the best ways to use your spare time productively. Reading material would be a welcome addition in the waiting room for patients who are not very technology savvy and prefer books over TV. Kids can be difficult to pacify but an interactive video game can keep the naughtiest of little ones quiet – both in the treatment chair and in the waiting room. Depending on your location and patient demographic you can pick and choose the facilities you want to offer to your dental patients. If we missed anything, please comment below to add to the list above. Facilitate your dental patients as much as possible by removing any complaints they could have about visiting your dental office.